As you have probably already picked up, I’m making my way through Sarah Foster’s Fresh Every Day cookbook. The salad section is incredibly diverse with a number of recipes that fit this season. As the tomatoes begin to ripen in our alleyway garden, you’ll begin to see much more of them in my posts. Picking the grape tomatoes one-by-one every night barefoot feels very rewarding (although Lu, my neighbor, deserves all the credit). This salad is perfect for along side a grilled piece of meat or fish – or as a main entree – or lunch the next day. While combination of ingredients was surprising to me at first, they came together naturally! Soak corn in water for about 10 minutes. Put them on a cookie sheet and roast for 20 or 25 minutes. Cool to room temperature, pull off husks and cut kernels off into a large bowl. Add bocconcini, avocado, grape tomatoes, basil and greens. Add Summer Herb Vinaigrette. I will most definitely be making this one! I’ve been wanting that cookbook forever, but I live right down the street from Foster’s Market so I rationalize purchasing sandwiches and salads instead of the cookbook. 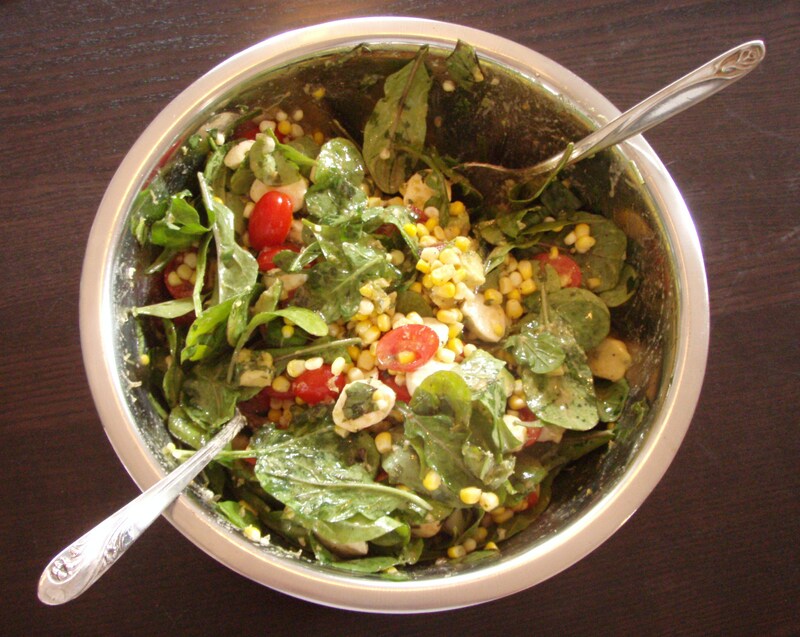 This salad looks delicious – it may be the thing that finally sends me out to the bookstore! This sounds delicious. Will definitely have to try this out. You should! It is GREAT in the summer when the corn and tomatoes are fresh! ahh…missing summer just thinking about it!